Please let the UW-Extension Bayfield County 4-H office know if you will be attending 4-H Winter Camp, Friday, January 18 – Sunday, January 20, 2019. Campers must be 14 years old OR in the 8th grade through 12th grade. The Health Form should be completed on 4HOnline https://wi.4honline.com prior to camp. Theme: The Game of Life! Cabin units are carpeted and heated. Sizes of cabins vary from 8-18 beds per unit. The camp utilizes a common shower area during the winter months. Bedding and towels are NOT provided in cabin units. Three well-balanced meals will be served in camps dining area for our group. Breakfast will be served on Sunday. No dinner will be served on Friday night, please plan to eat before you arrive. If you have a long drive home on Sunday plan to stop for food or pack snacks. 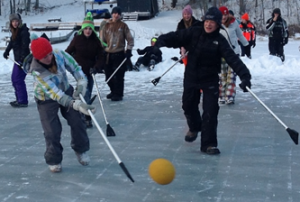 Broomball, time to explore the beautiful camp surroundings will compliment a rotation of educational rotations. The camp has a limited number of snow shoes available. If you wish to ski and have access to equipment, feel free to bring them. Aspen Lodge: Indoor game room which includes ping pong, climbing wall, air hockey, carpet ball and music. Winter boots, hat, mitts/gloves, etc. Health Form and Expectation Statement. Health Forms should be completed on 4-H Online site.